よっ。When will it be warm again? Will it ever be warm again? It seems as though every once in awhile I get the hankering to ramble on again about anime games. Anime is popular, so where’s the budget for video games based on popular anime series? Why is it we can get a few dozen Atelier games brought West a year, but something like Idolmaster is a no-go? Is it a voice licensing issue? A localization pipeline problem? Wouldn’t it make more sense to gather up all of your resources to produce a truly great game based in the Sword Art Online universe, rather than pushing out yet another mediocre one every year? When is the last time a game based on an anime series was released and turned out to be a genuinely great game, and not just “okay”, or “appreciable by fans of the series”? As the medium becomes more popular and widespread, it becomes more mind-boggling as to why some of the series which should lend themselves so perfectly to a video game adaptation so often fail to capitalize on the idea. Being an alternative to FullDive virtual reality, Augma has seen tremendous success for those cognisant of the Sword Art Online debacle four years ago. This newer technology, a headset worn by the user, supplies an augmented view of the world around them. It can be used for a myriad of purposes – messaging, music playback, internet access, and even as a form of revenue through the breakout hit ARRPG Ordinal Scale. Within the world of Ordinal Scale, which resides parallel to our own, anyone can be a hero, and those with outstanding rank can even reap real world rewards from participating retail partners. How much safer is augmented reality than VR though? When the tangible and fictitious overlap, where does that leave the soul of man? It all comes back to Aincrad, doesn’t it? There are, as seems tradition with this series at this point, contrivances within the plot to keep things moving, but this is a fairly paced film without any real filler or any throw away scenes to think of. The plot does enough to keep you engaged, and as a bridge between the two existing seasons of the anime and the upcoming one, it plants its seeds well without distracting from what it needs to make this film feel self-contained at the same time. The premise of an AR RPG, and the idea of the technology being more cutting edge than full dive VR seems rather odd, but when you look at where something like Pokemon Go went at its peak, and how commercial VR headsets are common, yet augmented reality devices are not, the premise of Ordinal Scale starts making sense, and even begins approaching believable to a degree. On paper, the concept of an AR game based around pretending you’re swinging a sword at an imaginary creature feels like an extension of LARPing, but it is admittedly salivating to think of rolling around town with a group of friends to slay creatures the general populace are unaware of. It has a Lovecraftian vibe to it, and evokes Hunter: The Reckoning as well. And this is what Sword Art Online has always been best at: concepts. Even when the execution falters in some damnable ways, the ideas nestled within SAO’s various narratives are if nothing else interesting and thought provoking. Then, once the action hits, this film is quite a treat. 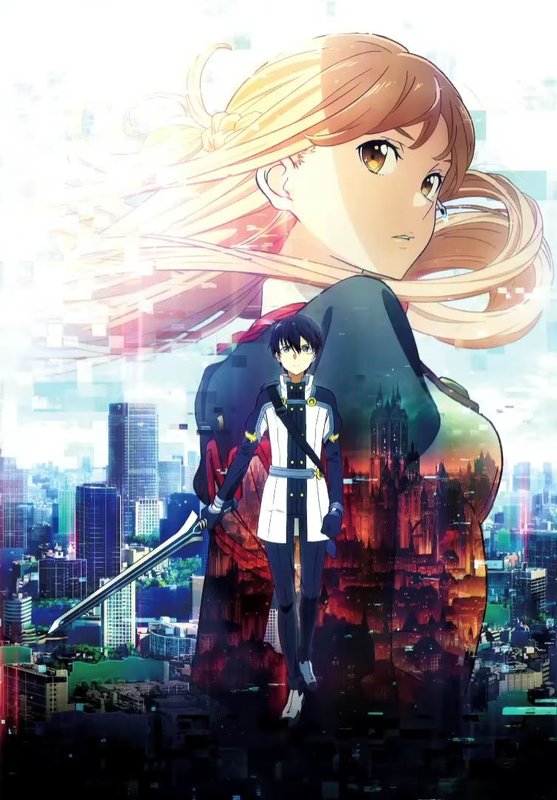 These sequences are stylish, fast paced and loud, and Ordinal Scale’s combat is a step beyond that of previous games in SAO in that not only does it require stamina and dexterity from the player, it being a real world activity, but the roles within combat are more traditional as well, so there are numerous great shots of player tanks with shields bravely enduring a flurry of attacks while the damage-doers look for an opening to seal the deal. The sequence which closes the film is particularly exciting, and pulls a few unexpected punches to further push the intensity. Sword Art Online The Movie: Ordinal Scale is the ideal film follow up. It reminds you of where the series has been and where it currently resides before sprinkling a tease of what the future might bring. It probably isn’t necessary viewing for SAO fans, but it is a film every bit worth a watch. When they were younger, Taira Daichi and Hoshifuri Sosogu promised one another that when they were old enough, they’d be betrothed. One day however, Sosogu moved away, and in the years leading up to her return, Daichi had all but forgotten about her. Sosogu never forgot about him though. Now an idol, she’s determined to reclaim the time the two lost, and to make Daichi remember the promise the two made to one another all those years ago. Thus begins an all too familiar tale told through an all too familiar drum. That’s a heart metaphor. Pop Team Epic is condensed nonsense. At times, this is a glorious thing to behold, with absurdist non-sequitur gags and bizarre references removed from all context delivered with a sputtering, flat-facedness which just begs you to break. 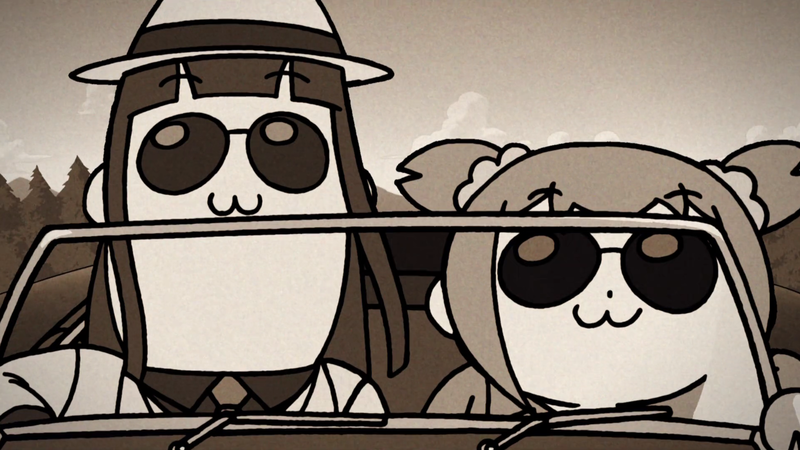 Most of the time however, Pop Team Epic’s attempts at eliciting a cheap laugh out of the viewer falls rather flat. It has a very ‘throw everything you can at the wall without worrying about how tacky it is’ style, which means segments sometimes drag on for longer than needed, gags will be revisited which weren’t especially funny the first time, aforementioned references might pop up with no accompanying punchline or purpose other than to say “Hey, remember that thing?”, and the list goes on. Sometimes though, you want stupid, and Pop Team Epic is very stupid. 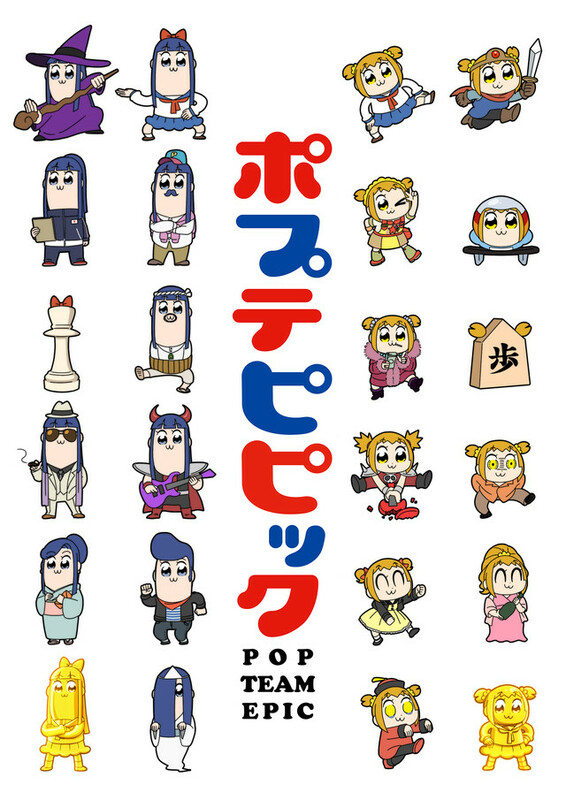 Where Pop Team Epic fails is not in its ambition. This is a hodgepodge of odd ideas and unrestrained silliness with a weird combination of visual styles and a nonsensical structure. Though she would appear the same as any other high school student, with high hopes for the future and a bright personality, Ichinose Hana harbors a terrible secret. Leading up to her high school exams, she contracts a most unfortunate case of the mumps. Due to this, she is unable to enter high school when she is supposed to, and thus is forced to attend a year late! When she arrives, the complex she has developed about reaching high school late begins to bear down on Hana. What would her new friends think of her if they knew? 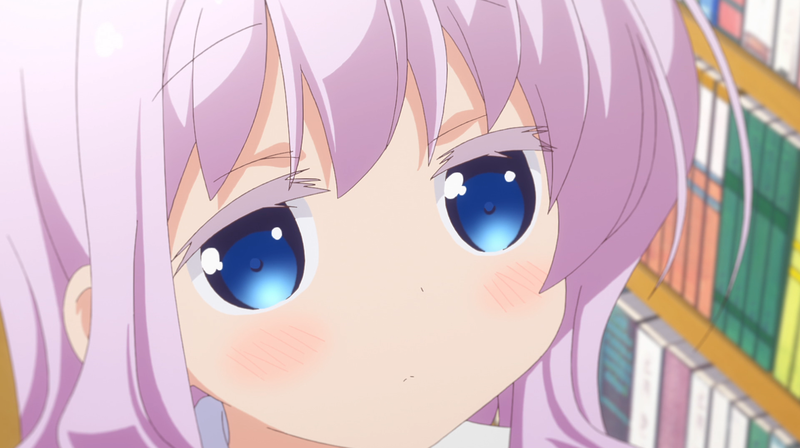 Leading the charge in the character design department this past season was Slow Start. 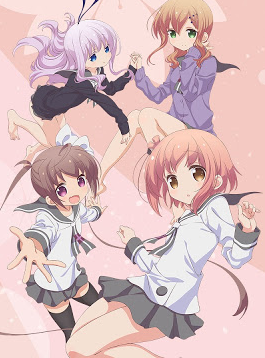 This is good, because aside from it’s energetic cast of nicely designed characters, Slow Start doesn’t offer much as far as narrative or memorable slice of life comedy scenarios. It’s a rather by the numbers series, which is of course disappointing. There is at least some character growth over its run time, and while it lasts, Hana and her new friends’ cuteness and overflowing energy does well to bring a bit of cheer; it’s just remembering what happened after the fact which poses a problem. 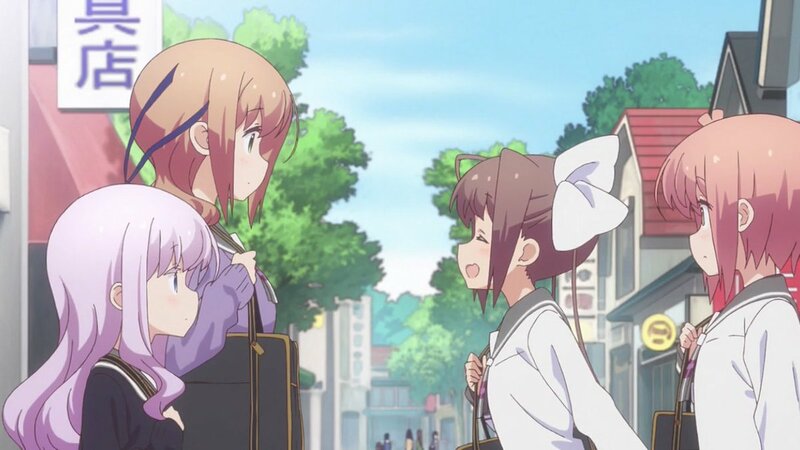 Slow Start knows what it is, and even if it doesn’t go out of its way to do anything new or interesting, this is a nicely produced and joy inducing slice of life series. Nishikata-kun has it tough. Rather short and rather middling when it comes to academics and athletics, not to mention a fan of decidedly not very masculine manga series, his self-esteem and patience is relentlessly tested by being at the receiving end of constant teasing. This teasing isn’t done by bullies or older siblings or anything of that sort though, but rather his seating neighbor at school, Takagi-san. 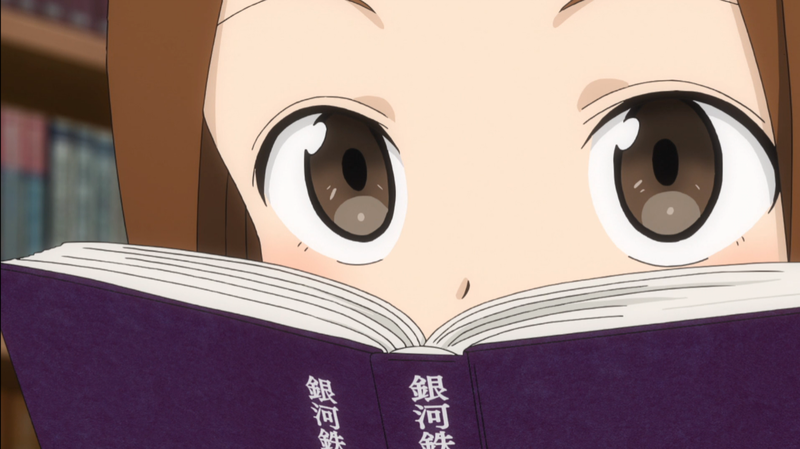 Though his plans to get the best of her always backfire, Nishikata is determined to get the best of Takagi-san and make her feel the same embarrassment she causes him. Then there’s Takagi-san, which after a preview last October, I was emphatically on board for. A somewhat more relaxed series than the typical moe affair, Takagi-san is closer to an adolescent love story than a comedy series. It becomes clear within the very first episode that Nishikata and Takagi have a special friendship, and it’s heartwarming to watch Nishikata attempt to keep these feelings at bay, while Takagi, clearly content with them, takes every opportunity to make him uncomfortable. Yamamoto Souichirou’s character designs come through great, and segments from another of his slice of life series, Ashita wa Doyoubi are incorporated as breaks in the going-ons of the main duo. 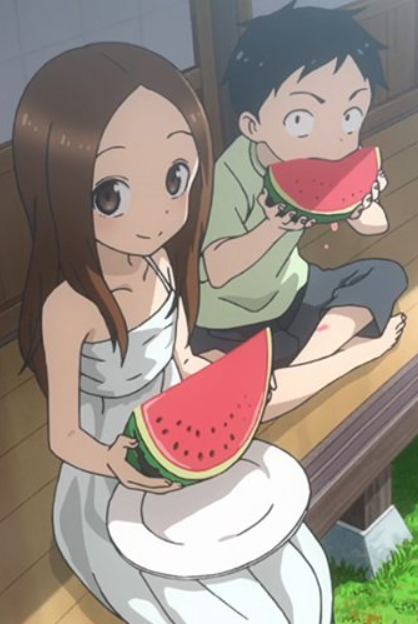 There isn’t a narrative here, but Karakai Jouzu no Takagi-san makes up for it with its warm, lovable slice of life antics. I’ve fallen off of Dragon Ball Z for the time being. That series, even Kai’s more condensed version, is a bit of a slog, and a repetitive one at that. If only there were a more abridged version I could watch somewhere… Nah, I’m sure nothing like that exists. Spring is here (! ), along with its accompanying anime season. Anything look good? I’m looking forward to gobbling up Amanchu!’s second season, and having watched the first episode of Gun Gale Online, I’m looking forward to seeing how that pans out as well.